I took this picture of a fire escape steel stairs located at the side of a building in Rosslare, Ireland. 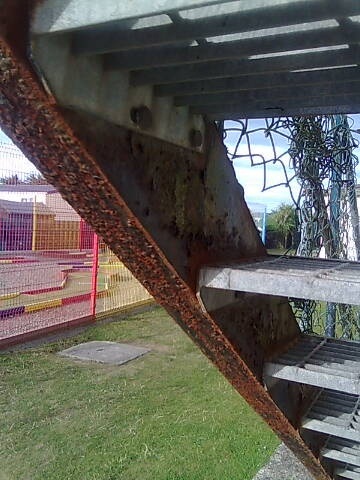 The interesting thing about this stairs is that two different forms of corrosion protection have been used to protect the same item against rust. 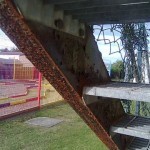 Galvanised steel was used for the steel steps while the supporting steel framework was protected with paint. 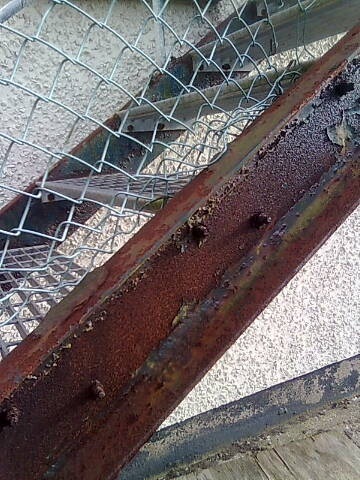 The additional protection that galvanising provides to the steel is clearly seen by comparing the rust on the supporting steelwork with the rust free steps. It is rare that a situation like this occurs where one type of finish can be compared against another because the steel should really be protected by the same method preferably a galvanised finish for external steel. Using stainless steel is another way of protecting against corrosion but although it also has the advantage of a clean smooth finish it is quite expensive. As a result it is usually only used in inaccessible areas (like wall cavities) or restricted to exposed architectural items like handrails and seats. It is also popular in internal humid environments where food is being prepared and rust needs to be avoided at all costs, for contamination reasons. Alternatively the steel can be painted, which is very popular, but in an exposed position this needs to be reapplied at regular intervals to prevent deterioration of the steel and regularly inspected for surface chip damage. I recently had to fix the float and split pin in our shop premises. On opening the water tank lid i noticed that the inside oem the tank had residue sticking to the inside walls. . Have you any idea what this could be. Id value your advise. Is the water suitable for drinking. Great post. Galvanising your metals is much easier than having to constantly paint them as you would if they weren’t protected.